Texas needs have clear and accessible data on its oil and gas industry. That’s why the Texas Legislature must fully fund the Railroad Commission of Texas (RRC) and support efforts led by state Rep. Rafael Anchia (House Bill 247) and state Sen. Jose Rodriguez (Senate Bill 568) to improve the accessibility and clarity of RRC data. The commission manages critical data on the Texas oil and gas industry. However, due to a lack of the funding necessary to fully staff and update archaic data storage and management systems, RRC data is difficult to access, unnecessarily complex and unclear. Funding to update the agency’s technology is fundamental to improving our understanding of the efficiency of the Texas oil and gas industry. Unclear and inaccessible RRC data has a ripple effect on our understanding of the oil and gas industry. 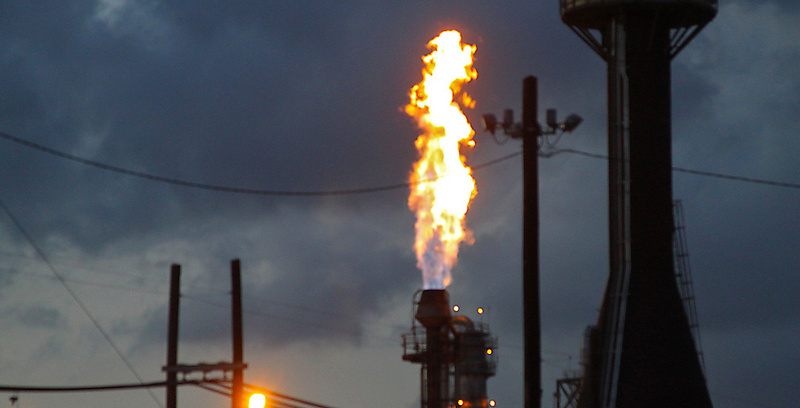 For example, because the U.S. Energy Information Administration (EIA) relies on the unclear data now provided on the RRC website, it drastically underreports the amount of gas being vented or flared in Texas. This is because the information on the RRC website is calculated by using only the gas vented or flared at processing plants, while excluding venting and flaring at oil and gas wells. As a result, just for the year of 2012, the estimated amount of gas vented or flared on the EIA and RRC websites fail to account for 48.5 billion cubic feet of wasted natural gas worth over $127 million. 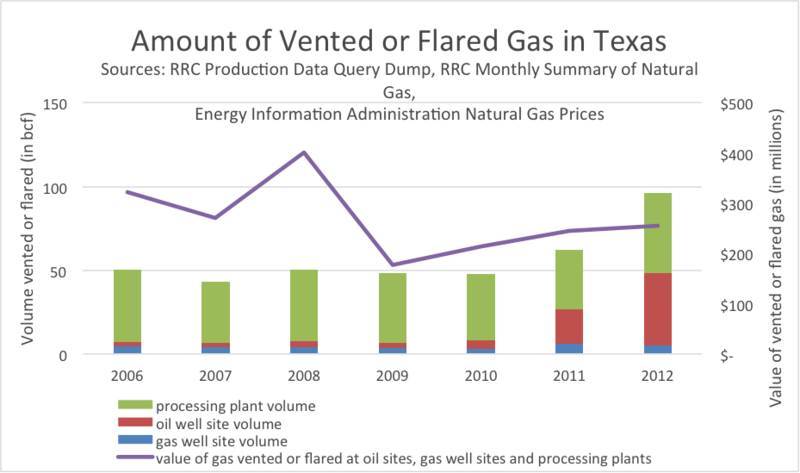 In more recent years, the volume of gas vented or flared at processing plants (what is reported in the RRC’s Monthly Summary of Natural Gas) is only a fraction of the total amount of waste that is caused from Texas oil and gas industry venting and flaring practices. RRC’s information on oil and gas venting and flaring practices provides a critical measure of the efficiency of the oil and gas industry. With improved access to and clarity of information on venting and flaring volumes, scientists and the general public can better understand why, when and where some types of organizations and wells vent or flare at a higher rate than others. Federal or state entities must take action to improve conditions for researchers to better understand the efficiency of the oil and gas industry. The EIA should consider uniformly collecting data on the amount of gas vented and flared at oil and gas wells and processing plants across the United States and making that data easily accessible to the public. If the Legislature does not want the critical task of obtaining this information to be left to the federal government, they must initiate efforts to increase the accessibility, clarity and accuracy of RRC data. The Legislature could start this process by rallying together to fully fund the RRC’s supplemental request to modernize their data storage systems and pursue policies that increase public access to information collected by the RRC. Justice (Ret.) Harriet O’Neill, Meadows Mental Health Policy Institute Board Member, Harriet O’Neill was elected to the Supreme Court of Texas in 1998 and re-elected to a second term in 2004. She retired from the Supreme Court on June 20, 2010, and founded the Law Office of Harriet O’Neill, A Professional Corporation, in Austin, Texas. 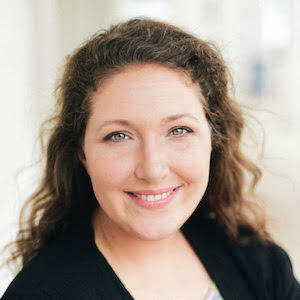 She serves on the board of the Meadows Mental Health Policy Institute.